Since our inception, the Garden has grown in all aspects developing into a world-class botanical garden and true asset to the community. However, the infrastructure of the Garden has not kept pace. 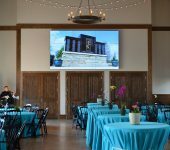 The physical growth of the Garden, programs and events have plateaued and will remain so without the next strategic step to move into the future. 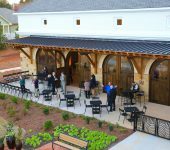 In January of 2016, we broke ground on a stunning new Guest Center that is sure to have a positive impact not only on our visitors but also on the entire North Alabama region. Tourism dollars will increase both from the increased visitation but also by helping to secure new national and international conferences and meetings for our area. Elements of this facility incorporates ideas from garden members, staff, project planning committee, and the community, and was masterfully designed by Matheny and Goldmon Architecture + Interiors. • Maximize revenue opportunities to provide resources for continued growth. 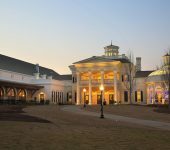 The Guest Welcome Center will feature three new premiere rental facilities, a gift shop and café, meeting rooms, and additional visitor amenities. 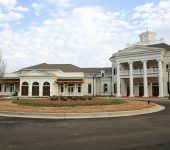 As you turn off the busy roadway, you are drawn towards the distinctive southern style building with stately columns and beautiful landscaping at the end of Botanical Drive. You know you have arrived at a special place, one that resonates with regional heritage and charm. You have arrived at a world-class botanical garden. and snacks in a friendly setting with both interior and patio seating. The Gift Shop, located just across from the Cafe, will more than double its current size and offer more new and exciting merchandise making your shopping experience… well, even more rewarding than it is now. 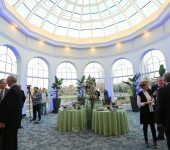 The mezzanine around the main Guest Center is open to the Atrium and offers a gallery space for exhibits. This level includes multiple offices, restrooms, storage, and a conference room with a balcony overlooking the Garden. Our goal for this very special project is $16,000,000 and we are well on our way to meeting that goal. There are many ways you can be a part. For additional information please call (256) 830.4447 ext. 246 or aalexander@hsvbg.org. 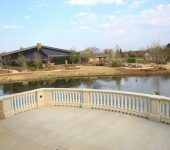 A Capital Campaign for the Huntsville Botanical Garden. If you would like more information on how you can become involved or would like to support this project, please contact the Development Office.